We offer TRACTOR SCOOPS for $90.00 you can rent a TROMMELL for $10.00 and its yours all day! We have three to choose from. Concentrates: MORE GOLD LESS WORK! 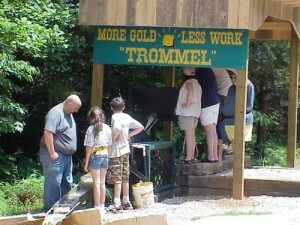 Our concentrates come from the amount of dirt we take from our gold mine and run through the trommel. All the lighter sand is washed out while all the gold and the heavy sand stays in the sluice. This is a natural process no gold is taken out or added! $325.00 For a Guaranteed Nugget Bucket!! You can also order online, click here to learn more!